Left-leaning media commentators and race hustlers like Jesse Jackson and Al Sharpton have made the appearance in Ferguson, Missouri, of Attorney General Eric Holder into something akin to the second coming. Only the federal government, in the person of the Nation’s first African-American Attorney General can ensure “fairness” in the investigation of the death of African-American teenager Michael Brown at the hands of white police officer Darren Wilson they claim. But according to United States District Judge Kurt Engelhardt, Attorney General Holder and the attorneys of his Department of Justice Civil Rights Division Criminal Section have a different idea of “fairness” than do most Americans. The unit that will be investigating the shooting in Ferguson and deciding whether to charge police officer Darren Wilson with civil rights crimes has a history of anti-police activities and unethical conduct that caused Judge Kurt Englehardt to issue a blistering 129-page opinion documenting prosecutorial misconduct by DOJ lawyers seeking to convict New Orleans police officers of civil rights violations. The 129-page opinion makes for frightening reading, (there’s a link at the end of this article) but a couple of things immediately caught our eye. One was that the government, in the persons of former First Assistant United States Attorney Jan Mann, former USAO Senior Litigation Counsel Sal Perricone and Karla Dobinski (a trial attorney in the Criminal Section of the Department of Justice's Civil Rights Division), engaged in a “secret public relations campaign" designed to make the New Orleans Police Department "the household name for corruption," and inflame public opinion against the defendants and others involved with NOPD, establish community acceptance of the government's version of the facts "before anyone set foot in a courtroom," urge defendants and others to plead "guilty" as a result, and prejudice the defendants during trial through online activities designed to secure their convictions. Judge Englehardt singled out attorney Karla Dobinski for especially strong criticism for her unethical conduct, but according to our friend J. Christian Adams, a former Department of Justice lawyer, Dobinski is still employed at the Holder-Obama DOJ. Another thing that caught our eye was that, in shades of the Lois Lerner investigation, once the government misconduct came under investigation relevant computer records for the US Attorney's office magically disappeared thus rendering what the court called "critical information" regarding further prosecutorial misconduct in the months before this trial "forever unavailable" as the Judge’s opinion termed it. To put the opinion in layman's terms; Holder's Department of Justice attorneys attempted to railroad the New Orleans police officers accused of civil rights violations in the aftermath of Hurricane Katrina. It might be possible to dismiss the findings detailed in Judge Englehardt’s opinion as merely indicative of the misconduct of a trio of unethical lawyers confined to the New Orleans U.S. Attorney’s office, except Dobinski was (and apparently still is) working as a trial attorney in the Criminal Section of the Department of Justice's Civil Rights Division – the same division that is investigating the shooting of Michael Brown. And an anti-police background is a virtual precondition for employment in that division since Eric Holder became Attorney General. As Adams detailed in a series for PJ Media, Loretta King, while serving as the acting assistant attorney general for civil rights at the outset of the Obama administration, ordered the resumes of highly qualified applicants to be rejected only because they didn’t have political or left-wing “civil rights” experience. Moderate, non-ideological, or conservative lawyers hired: 0. Of course Holder would never admit to applying a “liberal” litmus test to new lawyer hires at DOJ; the Department instead refers to it as a requirement that all successful candidates have “civil rights experience.” But, says J. Christian Adams, their definition of “civil rights experience” only includes prior employment, membership, or affiliation with left-wing advocacy organizations. We have a lot of questions about how Michel Brown ended up getting shot to death and how the police in Ferguson subsequently handled the protests and riots there, but throughout we have said whether Michael Brown’s actions somehow justified Officer Wilson shooting him six times is ultimately a question for a police investigation, and if necessary a prosecutor and a jury. The investigation of Brown’s death should not be a political question; it must be handled according to the rule of law to dispassionately establish the facts, not politicized. With Missouri’s Democratic Governor Jay Nixon calling for the “vigorous prosecution” of the case and the record of anti-police bias and misconduct at Attorney General Eric Holder’s Department of Justice Civil Rights Criminal Division the hope for an investigation to “dispassionately establish the facts” seems to be receding, not advancing. You can read J. Christian Adams’ column on the leftwing resumes of the new hires at Eric Holder’s Department of Justice through this link. Click here to read Judge Kurt Englehardt’s blistering 129-page opinion documenting prosecutorial misconduct by DOJ lawyers seeking to convict New Orleans police officers of civil rights violations. Sign our petition to impeach Eric Holder. Submitted by wanderer on Fri, 08/22/2014 - 01:19. It seems everything this administration touches is wrong. o'Criminal is the most destructive president by far of all we have had. Now, with the intrusion of the federal government into a local problem that the state should be handling is out of control. 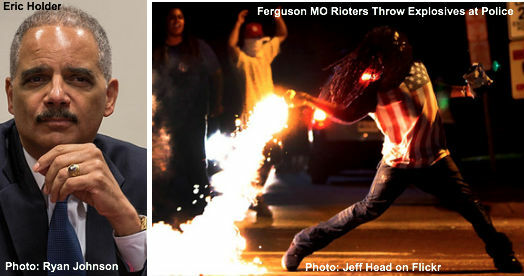 We have black racist, black panthers, sharpton, jackson and now eric holder inciting these idiots to riot. I guess once they have destroyed their community, they will expect the taxpayer to rebuild it. What ever happened to a thing called common sense, respect for your community, and respect for your neighbor. Is this what is happening part of the common core teachings or the mentality of the low information voter. Submitted by RED on Thu, 08/21/2014 - 16:20.
so wait, they are protesting because now you are allowed to disrespect the law??? YOU SHOULD IGNORE A COP WHEN HE SAYS FREEZE HAHA, where and when in this country did our laws change and give citizens the right to ignore a uniform officer?? i want to know? where are these THUGS COMING FROM? what makes them think they can do what they want? YOU GO OUT AND BREAK THE LAW, IM SORRY, YOU PAY! GOD HELP US! Submitted by waynesalhany on Thu, 08/21/2014 - 13:44. The public seems to think that a focus on a few bad actors at the top of the heap will rectify a bad situation. Is this really the way things work? The do-as-you-are-told mentality has not served us well. It would be easier politically to go after some of the smaller fry and watch the water flow uphill, so to speak. There seems to be an institution of corruption in play.